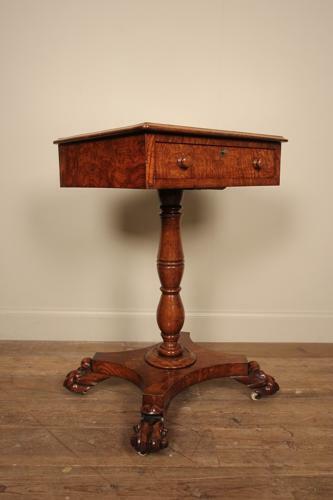 A highly unusual William IV side table made in beautiful figured and pollard Oak, having a single fitted drawer and retaining the original knob handles. Raised on a turned pedestal with quadraform base terminating in wonderful lion paw feet, the feet with original inset brass castors. Superb graining, retaining the original finish with good colour and lustre throughout. English, Circa 1840.